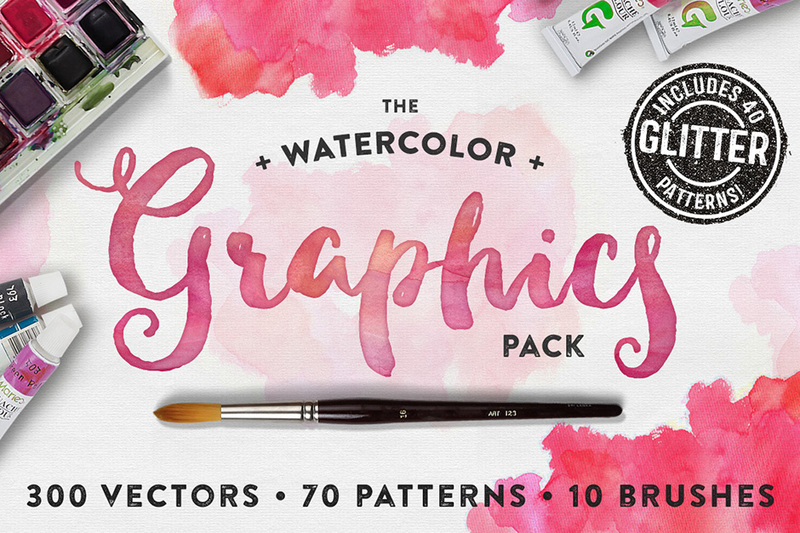 Introducing the Watercolor Graphics Pack! With Glitter! I’ve lovingly painted & hand-sketched over 300 elements for your creative pleasure, then vectorized them all, and imported them into Photoshop on individual layers, to make your workflow easier. Then, to spice up your vectors, I’ve included new 30 watercolor patterns, as well as 40 glitter colors, and 10 bonus sparkle brushes to make your new vectors shine! Use the vector graphics on logos, invitations, greeting cards, packaging, flyers and more! Use the glitter and watercolors on graphics, vectors, type…anything you want! The sky’s the limit! • 190 Hand Painted Vector Elements (.AI & .EPS + .PSD). • 110 Hand Drawn Vector Elements (.AI & .EPS + .PSD). • 10 Bonus Sparkle Brushes for Photoshop (.ABR file). • Instruction Guide to help you install the .PAT & .ABR files, and get going! Add some watercolor (and glitter) goodness to just about anything! Software compatibility: Adobe Photoshop and Illustrator CS and newer. File size is approx 460.8MB (541.8MB unzipped), offered as a single download. Will this work with adobe photoshop elements 12, 15 or 18? Thank you so much for reaching out to us and I am so sorry for any confusion caused by the compatibility of this pack. Rest assured we always list the file types included in our packs so my apologies if you missed this, but the great news is that I can certainly help you with this and have popped you over an email!